The Seattle Seahawks appeared to be a team on the rise as they faced the Chicago Bears on November 5, 1978. Head Coach Jack Patera’s squad, in its third NFL season, had a 4-5 record after a tough overtime loss to the Broncos the previous week, but considering that they won a total of five games in all of 1977, it marked definite improvement. Scrambling lefthanded QB Jim Zorn led an exciting offense that also featured WR Steve Largent and FB Sherman Smith (pictured at right). The revamped defense was playing well and two rookies, FS John Harris and OLB Keith Butler, were making significant contributions. The Bears, for their part, had lost six straight games after a promising 3-0 start. 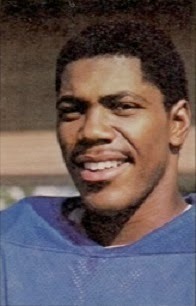 Under first-year Head Coach Neill Armstrong, they were dependent on the running of HB Walter Payton and FB Roland Harper. The defensive backfield was strong, but there were questions regarding the defensive line and linebackers. There were 57,359 fans at Soldier Field on a pleasant but windy afternoon. The Bears reached midfield on the game’s first possession but had to punt. Taking over at their 30 following a 14-yard punt return by HB Rufus Crawford, the Seahawks drove 70 yards in 15 plays. Seattle converted three first downs, including a third-and-13 at the Chicago 22 when Jim Zorn scrambled for an 18-yard gain. Sherman Smith ran effectively, carrying the ball seven times for 33 yards and including a one-yard touchdown carry to finish the series off. Efren Herrera added the extra point to give the visitors a 7-0 lead. The teams traded punts as the game moved into the second quarter. Seattle put together another long and promising drive, starting at their 27. Zorn threw to Steve Largent for 20 yards and to WR Sam McCullum for 18 as the Seahawks moved methodically down the field. Smith and HB Al Hunter carried most of the load, but after reaching the Chicago eight, Smith fumbled and CB Virgil Livers recovered for the Bears. The teams once again exchanged punts, and Zorn was sacked on back-to-back plays in Seattle’s next series. A shanked punt by Herman Weaver gave the Bears possession at the 50 and Avellini immediately threw to TE Greg Latta for 17 yards and followed up with a 14-yard completion to WR James Scott. The drive stalled at the Seattle 16 and the Bears got a break when Bob Thomas missed a field goal attempt but was roughed while doing so. While there were offsetting penalties, it still provided Thomas with a second chance from 33 yards and this time he was successful. With 1:17 remaining to play in the half, the Seahawks struck quickly in response, taking just four plays to go 73 yards. 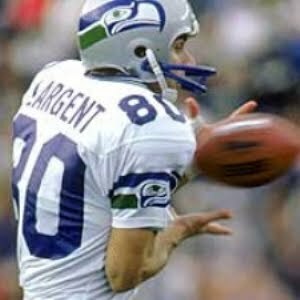 Zorn threw to Smith for 17 yards and McCullum for 10, and then hit on back-to-back passes to Largent (pictured below). The second was good for a 26-yard touchdown and, with Herrera’s extra point, an extended lead of 14-3. In the last 30 seconds, the Bears had one last shot before halftime and, thanks to an Avellini completion to WR Golden Richards that picked up 17 yards, were able to get a 36-yard field goal by Thomas before time ran out. Seattle took a 14-6 lead into the intermission. The Seahawks went three-and-out to start the third quarter and the Bears had good field position following the punt. Mike Phipps was now at quarterback and completed two passes, most significantly to Roland Harper for 16 yards. Thomas kicked a 39-yard field goal to narrow Seattle’s margin to five points. The Seahawks came back with a seven-play, 72-yard drive. In a second-and-13 situation, Smith took off for a 21-yard gain into Chicago territory and three plays later Zorn connected with Largent for a 31-yard TD. Herrera added the PAT and it was a 20-9 game in favor of the visitors. Phipps threw to Scott for a 26-yard gain to start the next series, but three plays later CB Dave Brown intercepted a pass at his own six yard line to end the threat. The Seahawks were unable to move on offense, however, and another short Weaver punt gave the Bears the ball back at the Seattle 38. They didn’t come up empty this time as Phipps connected with Harper for a 20-yard touchdown. Thomas added the extra point and it was once again a five-point game. On the first play following the ensuing kickoff, Smith broke away for a 67-yard gain to the Chicago six. It was from there two plays later that Smith finished off the short series with a touchdown carry. Herrera’s kick made the score 28-16. As the game moved into the fourth quarter, the teams again traded punts before the Bears put together a 10-play, 64-yard scoring drive. They kept the ball on the ground, with Walter Payton and Roland Harper running effectively. Payton ran the last seven yards for a TD, but a bad snap on the try for extra point forced holder Brian Baschnagel to try to run for the point. He failed and the tally stood at 28-22 with 7:33 remaining to play. Seattle came back to put more points on the board. Zorn threw to Largent twice, for 19 and 10 yards, and Herrera kicked a 34-yard field goal to increase the margin to nine points. Phipps went to the air on the next series and was picked off by CB Cornell Webster. A short series by the Seahawks ended with Zorn failing to complete a pass on a fourth-and-four play at the Chicago 37. With Payton running for 19 yards on the next play, the Bears drove 63 yards in eight plays and Harper carried for a two-yard TD. Thomas made the extra point this time to narrow the margin to two points, but there were just 35 seconds left on the clock. Chicago had only one option, an onside kick, but they were set back 15 yards due to a taunting penalty on OT Lionel Antoine, who tapped Seattle LB Terry Beeson on the shoulder after the touchdown and then made a show of spiking the ball in front of him. As a result, the kickoff was from their 20, but the Bears successfully recovered the short kick. Following a penalty, Phipps threw to Scott for 22 yards but, after reaching the Seattle 46, a pass intended for Richards was intercepted by Webster to finally nail down the 31-29 win for the Seahawks. The Bears led in total yards (401 to 389) and first downs (26 to 23). They also sacked Zorn five times, to two sacks of Chicago quarterbacks by the Seahawks. However, Chicago also turned the ball over three times, to one suffered by Seattle. Sherman Smith had a big day, rushing for 152 yards on 23 carries that included two touchdowns. The yardage total set a new record for the young franchise. Jim Zorn completed 13 of 24 passes for 208 yards and two touchdowns with none intercepted; he also ran for 25 yards on three carries. Steve Largent also had a big performance, catching 6 passes for 126 yards and two TDs. For the Bears, Walter Payton ran for 109 yards and a TD on 18 carries and caught 5 passes for another 36 yards. Roland Harper had 13 carries for 57 yards and a score and contributed a team-high 6 pass receptions for 71 yards and a touchdown. James Scott gained 88 yards on his 5 catches. Bob Avellini was successful on just 6 of 15 throws for 68 yards while Mike Phipps was 15 of 25 for 177 yards and a TD, but also tossed three interceptions. The win over the Bears evened Seattle’s record at 5-5, and the Seahawks went on to win four of their last six to finish at a highly respectable 9-7, good for third place in the AFC West and barely missing the postseason. Chicago’s losing streak reached eight the week following the Seattle game, but the Bears then finished strong with four wins in their last five games to end up fourth in the NFC Central at 7-9. 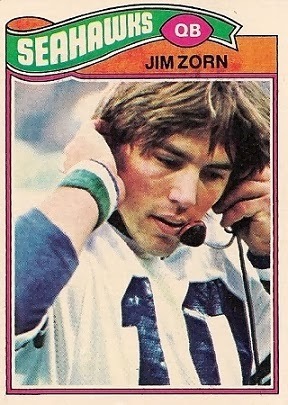 Jim Zorn led the AFC in passing yards with 3283 while completing 56 percent of his passes and tossing 15 touchdowns – however, he also threw 20 interceptions and led the NFL by being sacked 44 times. Still, his mobility was a tremendous asset as he gained 290 yards and scored six TDs running the ball and certainly was a key to the team’s success. Sherman Smith missed four games due to injury but rushed for 805 yards on 165 carries (4.9 avg.) and caught 28 passes for 366 more yards (13.1 avg.) and a total of seven touchdowns. Steve Largent had 71 catches for 1168 yards and eight TDs and was selected to the Pro Bowl.